Readers of the Gadget Helpline may recall our recent review of the MilestonePod – an impressive little innovation in fitness technology specifically designed for the runner which records criteria relating to foot position and pace while running to give a surprisingly detailed report on how you’re performing when out there kicking asphalt. Well we were delighted when its maker, Milestone Sports, told us they have a brand new model hitting the market soon and that this one would be available to buy here in the United Kingdom. We were even more delighted when they informed us that they were pleased with our last review and asked us to be their tester once again – So here’s our coverage of the MilestonePod – Version 3! What’s immediately noticeable is that the new MilestonePod has been completely redesigned and reworked – even the packaging is more compact, with stylish new branding and the Pod is attractively presented when you open up the slip case. This makes for a really great first impression. If you saw this on the rack in a running store we think you’d want to pick it up and take a look at the product based on appearances alone. In the box, you’ll find the new lightweight Pod and underneath this the battery and a small quick start guide and some FCC testing info. Before you get started you’ll need to put the battery in – which takes a little bit of figuring out and isn’t covered in depth on the quick start card. However, a brief glance at the FAQ section on the MilestonePod website helps clarify how it’s done (we’ve also provided a video below, which we hope is handy if you buy one). Twisting the holder on the back of the Pod anti-clockwise will click it loose, and then a coin or key is required to open the battery compartment and the watch style battery is inserted + side up. If inserted correctly a red/green light will flash on the front of the Pod. Tighten it up and thankfully you won’t have to worry about opening it up to replace the battery for at least 6 to 8 months, depending on how much you use it. The Pod holder sits comfortably behind your laces and doesn’t require you to un-thread them like the previous model’s holder did (if you can slide it in behind them) and clicking the Pod clockwise ensures it’s securely fastened. As with the previous model the app is an important part of the MilestonePod system. If you already have the app installed as an existing Pod owner just visit the Google Play Store for Android devices or the App Store for iPhone to update to the new version which essentially looks and works the same, albeit with some new branding. It also conveniently brings up all your past run logs for your last Pod, if you sign in with your previously registered email address or Facebook info. To test the Pod I took it out on a few short runs on pavement, and also my weekly 5K Parkrun which involves trail and gravel track. The Pod is incredibly lightweight and is barely noticeable when running in any condition or on any terrain, which the new design and shape helps with. Despite the last generation model being not much larger than this, the shape meant it could be felt sometimes, particularly when the foot was flexed or tackling uphill terrain. This is just a minor gripe which no longer seems to be an issue with version 3. As with the last Pod, there was the initial question of ‘is it on?’ – But this is made much clearer thanks to the addition of a bright green LED light that emits a little flash when the Pod makes contact with hard surface and you’re ready to get started. Another small but well thought of detail, and much more visual than the screen on the last model. Once the Pod realises you’re in motion, whether it be a run or a steady walk, it will begin its data recording and then fills in the previous few minutes for an near accurate total. So, if you’re wearing it on your shoe and just dash for the bus from standing stationary, this will be too short and the Pod won’t record this as an actual running/walking session. This is good, because it doesn’t clutter up your run log with pointless data. Remember this isn’t a fitness tracker, it won’t count your every step like a Fitbit – It’s designed for the runner/walker and what it does it does well. This is reflected in the stats you get when you sync Pod to app. 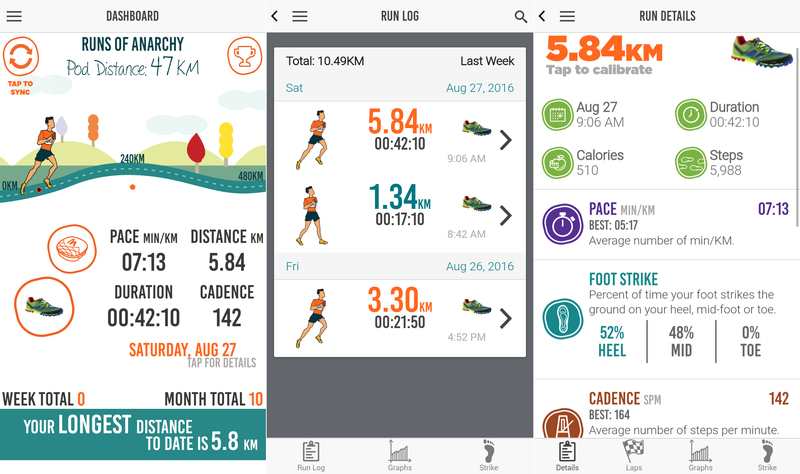 From the Dashboard you can see an overview of your most recent run, with distance, duration, pace and cadence all appearing on the home screen. Also displayed here is a random statistic at the bottom, such as your best pace to date, longest distance or your “Runficiency” – your overall performance based on all recorded data with a maximum score of 100 points to be achieved. In the side menu you can access and view all your individual Run Logs in greater detail, which includes steps taken, calories burned per run and some really great stats on your rate of impact, stride length, leg swing and foot strike – really very detailed stuff. We assure you, you’ll be impressed by the amount of info about your run that the little Pod actually records. As well as Run Logs you can view your Rewards (if you have any – as of yet, I don’t!) as well as setting Insights, which are areas such as cadence, ground contact and stride length – things you’d maybe like to focus on and specifically improve on. Also in the menu you can change your Pod and app’s settings and add another Pod if you want – all with the app’s clear and inviting user-friendly interface. The price of the MilestonePod will be £25 when released in the UK this week on Amazon, which is actually cheaper than what I’ve paid for some running shorts! We hope after seeing what this gadget is capable of you’ll get the appeal of this invaluable bit of kit, not only for tracking your runs but also providing great information on how to improve your running form and, most importantly, avoiding injury! For more info and to purchase one please visit www.milestonepod.com. The Gadget Helpline would once again like to thank the team at Milestone Sports for allowing us to test the New Milestone Pod.